Last autumn when I wasn't really paying much attention at all, too depressed, Paul got the seed potato order organised for me. The one variety we try always to grow is Ambo but in 2014 we weren't able to source any. We grew a row from some saved tubers which seemed healthy and I'm not sure if they were the cause but we had terrible blight last year which I wasn't able to do much about. So I didn't want to risk home saved seed tubers again. The only supplier we could find this year was Tuckers. 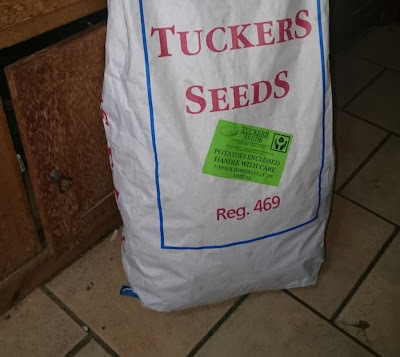 They are a well established company with a big range and we've used them before but all the packs of seed potatoes are quite large, 2kg minimum which means we now have 18kg of spuds to plant, with carriage costing over £50. You can buy an awful lot of commodity potatoes for that sort of money. Still, we've managed to secure a good range of our favourites and perhaps I can find a few local peeps who'd like a handful of novelties to try out for next year. Maris Piper - rather more conventional than our usual choices but we wanted to see why they've been so popular for so long. Kestrel - a potato I have mixed feelings about. It's good but in some seasons produces rock hard tubers, fine for slug resistance but strangely unappealing in the kitchen. Seems to be better here in France than on the old allotment in Newport Pagnell. British Queen - the potato we grow for chips. She's lovely but not terribly tough and needs good soil for a big crop. BF15 - has a following of devoted fans and I've been one for years. Easier to get in France than the UK, I first grew it from tubers from a packet bought for dinner in a supermarket. Arran Victory - sturdy, late, lovely purple skin and they do well for us. Ambo - a good general purpose potato that we've grown since our first gardens together. Makes lovely big baking potatoes and nice roasted. Suits the way we grow potatoes. Epicure - another old favourite. A first early, not quite as fast as some but much better flavoured. Shetland Black - delicious, great for soups and stews. There's lots of erudite discussion about the 'true' black but these are the commercially accepted sort and I like them very much. Reviewing the list it's clear that we are keen on high dry matter, floury potatoes and that seems to set us apart from the French. Judging by the supermarket selections, they mostly prefer the sort known as 'waxy' although that's not a very good description in my opinion and should be reserved for salad potatoes like Pink Fir apple and Ratte. Another reason for growing our own.